"This is my dog Journey as a 16-week-old puppy. She is a female French Bulldog / Schnauzer mix." The Miniature French Schnauzer is not a purebred dog. It is a cross between the French Bulldog and the Miniature Schnauzer. The best way to determine the temperament of a mixed breed is to look up all breeds in the cross and know you can get any combination of any of the characteristics found in either breed. Not all of these designer hybrid dogs being bred are 50% purebred to 50% purebred. It is very common for breeders to breed multi-generation crosses. Juju the Miniature French Schnauzer shown here as a puppy at 3 months old—"Juju is very smart, loves attention, is well behaved and loves to play. She gets along with all my pets. 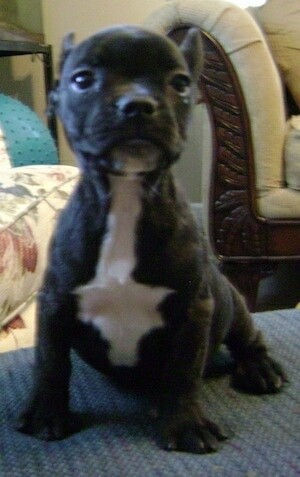 Her dam is a French Bulldog and her sire is a French Bulldog / Schnauzer 50/50. She likes to run and jump a lot and loves kissing. Most of all she loves to eat. She is brindle in color."